Pelicans head coach Alvin Gentry speaks with media following the conclusion of the 2018-19 season. Pelicans guard Jrue Holiday speaks with media following the conclusion of the 2018-19 season. Pelicans forward Anthony Davis speaks with media following the conclusion of the 2018-19 season. Pelicans forward Solomon Hill speaks with media following the end of the 2018-19 season. Pelicans guard Elfrid Payton speaks with media following the conclusion of the 2018-19 season. Pelicans forward Julius Randle speaks with media following the conclusion of the 2018-19 season. Pelicans forward E'Twaun Moore speaks with media following the conclusion of the 2018-19 season. Pelicans guard Stanley Johnson speaks with media following the conclusion on the 2018-19 season. Pelicans guard Ian Clark speaks with media following the conclusion of the 2018-19 season. Anthony Davis says he has no regrets about his decision to ask for a trade from the Pelicans, but he acknowledges there is still a possibility he could start next season in New Orleans. The New Orleans Pelicans now know their chances heading into the NBA Lottery on May 14. 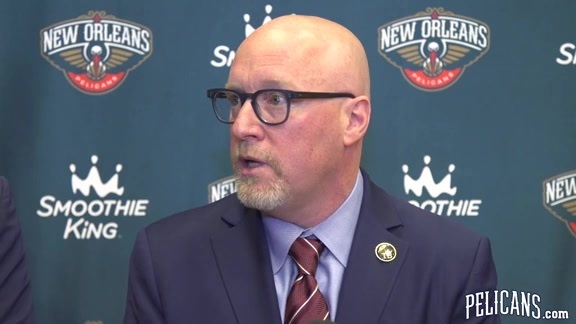 Less than 24 hours after Tuesday’s final buzzer – which brought a merciful end to what was a frustrating and disappointing season – it was time for New Orleans players and coaches to look ahead this morning.